Support all your clients over the internet. FREE! for any number of clients. Support your clients the easy way! Remote Assistant has emerged out of a simple need to help customers via remote administration, without having them install complex (and often expensive) software and perform operations, that they are not trained to do or that require administrative permissions, which they may not have. Safety was also an issue, because every time a client opens their computer for remote administration, there's a valid security concern. This is why we invented the Remote Assistant - the most simple, yet powerful remote support tool, which can be easily bondled with your appilcation and customized to your needs. In Remote Assistant the client always initiates connection to the remote Admin, who can handle multiple simultaneous sessions. This removes the concern of client having to open any ports and/or keep any service running (with a possibility of compromized authentication). Remote Assistant is secure, while not requiring any login/password! The client always connects to an admin they trust, so there's no need to authenticate the connection. Once the session is over, the host application closes, leaving no security holes. The connection is secured by farily strong continuous encryption. With our competitive pricing we ensured that any software developer is able provide their clients with the best and most immediate service, by embedding FREE remote host software into their applications. In order for your customers to be able to connect to your computer for assistance you will need either static IP address or dynamic IP address registered with one of the dynamic DNS services. 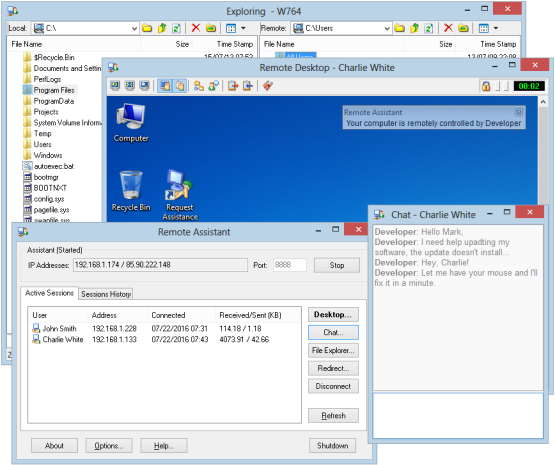 Remote Assistant software by default anticipates connections on port 1973. If you need to modify that, start Remote Assistant (or double click on the icon in the system tray if it is already started). Press "Stop" button to stop the listener, modify the port number and press "Start" button again. At this point the configuration is saved (in the RemoteAdmin.cfg file located next to the executable) and will be enforced every time when you start Remote Assistant. You can also specify multiple ports in Options. Make sure to let your customers know if you have changed the default port value. Normally, a shortcut to the Remote Assistant is places into the startup folder under Start/Programs menu, so the program starts automatically every time you log into your computer. 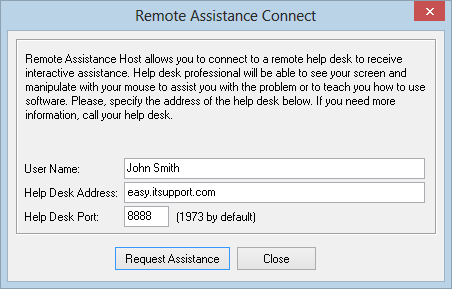 Your customers will need Remote Host in order to contact your help desk. Remote Host is a small (less than 1MB) free utility and is available at the download section of this website. You can freely distribute Remote Host with your application or separately without any royalties free of charge. You can post links to Remote Host and even publish Remote Host on your web site for others to download. You could create custom installation and embed your preconfigured cfg file, which will direct your clients to your help desk and customize look and feel of the remote host application. Please, see help and demo configs avaiable with trial (below) for more information. Questions or comments? E-mail us at info@contextsoft.com © 2016 Context Software LLC. All Rights Reserved.